After the TREAD Act was mandated in 2007, all vehicles manufactured in the United States beginning in 2008, must be installed with direct or indirect TPMS systems. 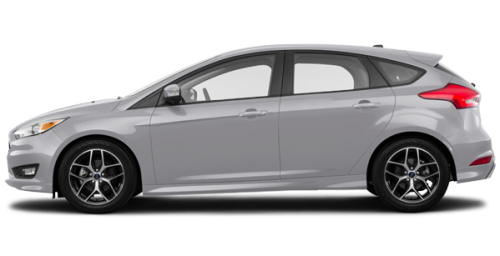 The Ford Focus uses a direct TPMS system, which means TPMS sensors are installed in the wheel. If one or more tires indicate low tire pressure, the TPMS sensors will transfer the information to the vehicle’s ECU. An indicator light (low-line TPMS system) or each tire pressure will show on the dash (high-line TPMS system). When one or more sensors are replaced in a Ford Focus, a TPMS relearn is recommended to write the ID’s to the vehicle’s ECU to turn the TPMS light off. Direct TPMS, TPMS sensors are installed in the wheel, tire pressure is communicated via radio frequency (RF) technology from the sensor to the vehicle’s ECU. A TPMS relearn is recommended when replacing a sensor. All OE and aftermarket TPMS part numbers and service kit replacement options for the Ford Focus can be found in the VT56, VT55, VT46 brands and VT36 TPMS Tools in “Service TPMS”. TPMS Diagnostic tool (VT56 or VT46 brands), step by step relearn procedures are written in the tool. TPMS activation tool (VT56, VT55, VT15, VT31, VT36 and VT46 brands) for a manual (stationary) relearn, step by step relearn procedures are written in the tool for the VT56, VT55 or VT46 brands and are available to complete a TPMS reset in the owners manual for the VT36, VT31 or VT15 tools. Important note, some models require the start button to be pressed twice (without pressing the brake) to enter RUN mode (Ignition ON/Engine OFF). If this is the case, modify steps 3 and 5 as noted. 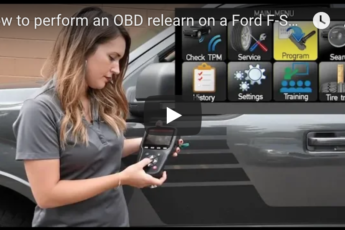 Ford Focus vehicles, years 2014-2019, can be reset via an OBD relearn procedure, as a “bonus” relearn using the VT56 or VT46 brands with OBD module. 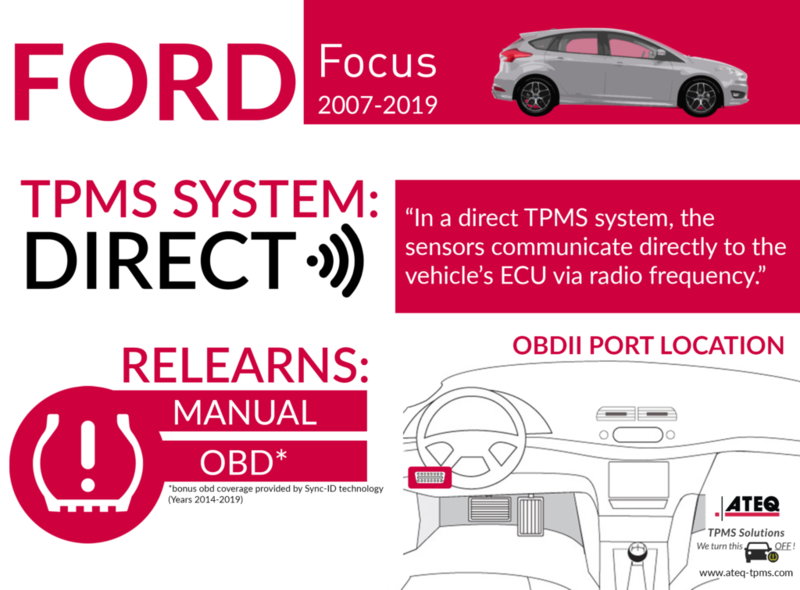 The OBD bonus relearn, known as Sync ID technology, eliminates having to perform a manual, relearn procedure or auto relearn, which requires either many steps or long driving time to turn off the TPMS light. If “OBD RELEARN” is an option, the sensor ID’s can be transferred through the OBD port. 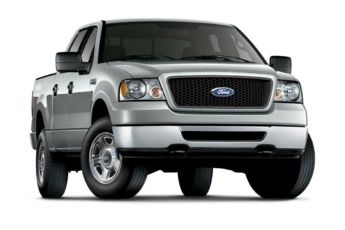 ATEQ expects to increase the bonus OBD coverage in time for Ford. After the OBD relearn is completed, you may be required to activate the sensors again to turn the TPMS light off to avoid driving the vehicle to turn the TPMS light off. Ford Focus vehicles may require the start button to be pressed twice during the relearn (without pressing the brake) to enter into RUN mode during the relearn (Ignition ON/Engine OFF). If this is the case, modify steps the manual steps for the push-button start relearn, 3 and 5, as noted in the relearn procedure above. 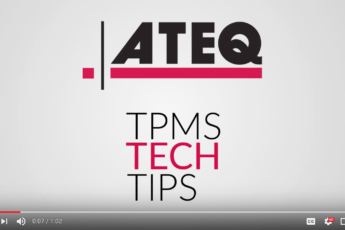 ATEQ participates in several trade shows and events throughout North and South America to present and demonstrate our TPMS tools and solutions. Visit us at an upcoming event to discuss how we can help with your business needs. Contact us for ATEQ TPMS news, media relations or marketing inquiries in North and South America.